Arsenal’s top hour hopes are hit marginally as Robin van Persie scores on his return to the Emirates to help Man Utd draw 1-1 with the Gunners. 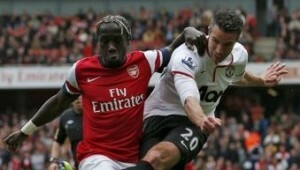 Arsenal hosted the newly crowned Premier League champions Manchester United at the Emirates Stadium. Arsenal got off to a blistering start with Thoe Walcott grabbing a 2nd minute goal. The Arsenal went on to dominate the first half but Robin van Persie scored the equalizing goal in the 43rd minute of the match through a penalty kick to level the score at 1-1. Both team pushed for the winning goal in the second half but ended up settling with a point each. Arsenal winger Theo Walcott scored an early goal to give the Gunners a 1-0 lead against Manchester United at the Emirates Stadium. The England international took advantage of a Robin van Persie mistake to fire Arsenal to an early lead in the 2nd minute of the match.